or download a Quick Cheat Sheet by By Nancy Blachman, Tasha Bergson-Michelson, & Jerry Peek. You can even download it as a PDF file from this site. Here�s a few of the tips from the Cheat Sheet. Provide definitions for words, phrases, and acronyms from the Web. Here's a crib sheet from Google on Search Tools (cribsheet.search.pdf). If you are looking for movies, the theaters and times for those movies, just type in movies:zipcode. I just did a search and now can see not only the movie theater times but a trailer and reviews. You can also do a search for the weather in an area. 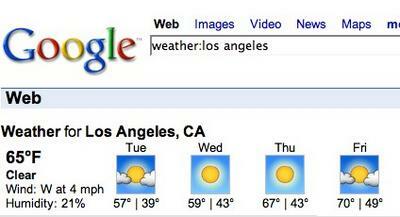 I�m going to LA tomorrow and don�t know the zipcode so put in weather:los angeles. Another site that provides tips on searching is Google Tutor to check out their Google Manual.